2011 November «Suad Bejtovic Photography etc. Suad Bejtovic Photography etc. A few months ago, my friend and photographer Tyler invited me to spend a few days in the Pacific Northwest. Although our main target were the National Parks in the area (photos from Mt. Rainier National Park and Olympic National Park are coming shortly), I wanted to get a good look at the city of Seattle. So, here’s a selection of best shots that I created with my new Mamiya 7 camera; all photos were made on Ilford Delta 100 black and white film. We’ll start this post with a view of Seattle’s most famous building. 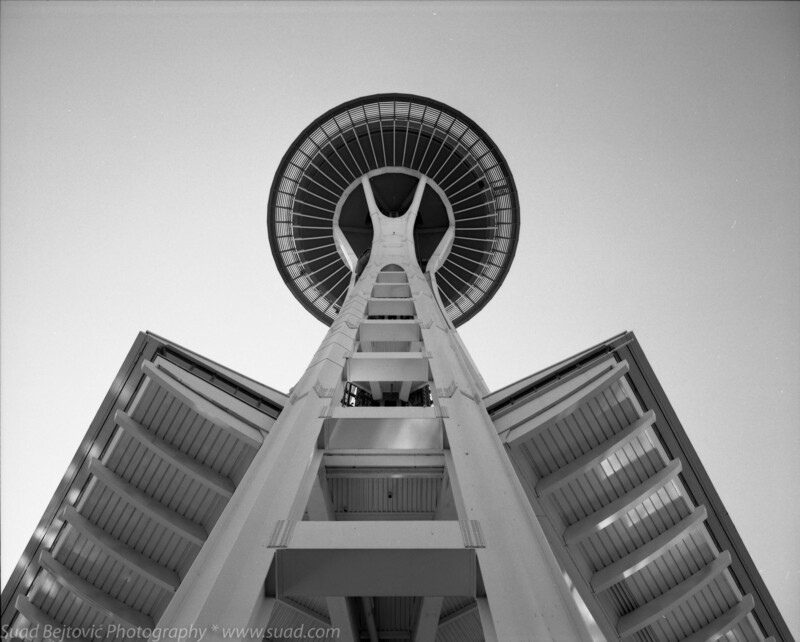 I’ve been on top of a few famous buildings, so I didn’t want to spend time and money climbing on top of Space Needle. I’m sure the view is great, but I had limited time to spend downtown, and the ticket was slightly over priced. Nevertheless, it’s still a very cool, sleek structure, in the middle of the city, surrounded by parks and businesses of all kinds. We’ll come back to it in a moment. Almost as famous as the Space Needle is the Pike Street Market. 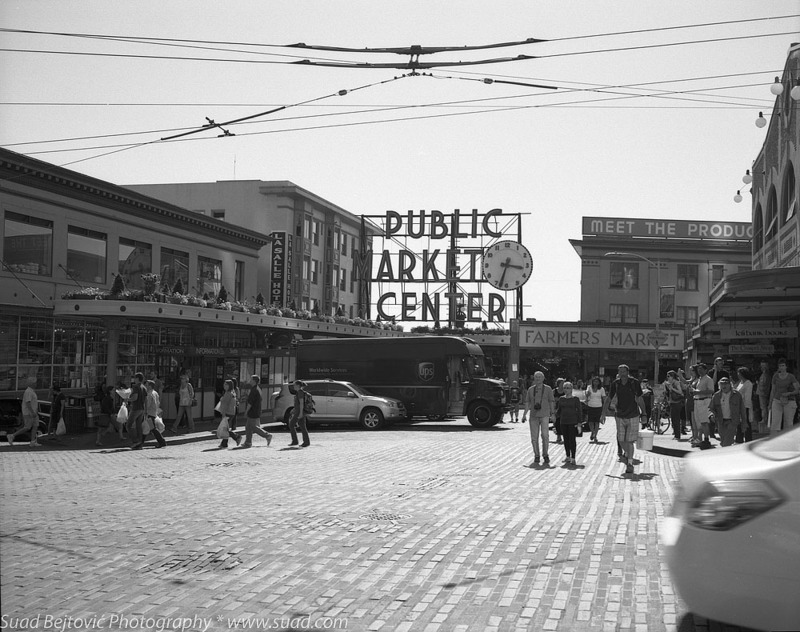 It’s blocks and blocks of shops and vendors, centered around the intersection of Pike Street and First Avenue. You may have seen the whole fish-throwing act; that’s right here. According to the clock, it was around 3:30 P.M. when this was taken. It was Thursday and it was lively; people having lunch, running errands, tourists with cameras around their necks, UPS truck deliveries… It’s a city center in many ways. Rewind a few hours, and go back about a mile, and this is the scene in a more quiet part of Pike Street, further up on the hill. 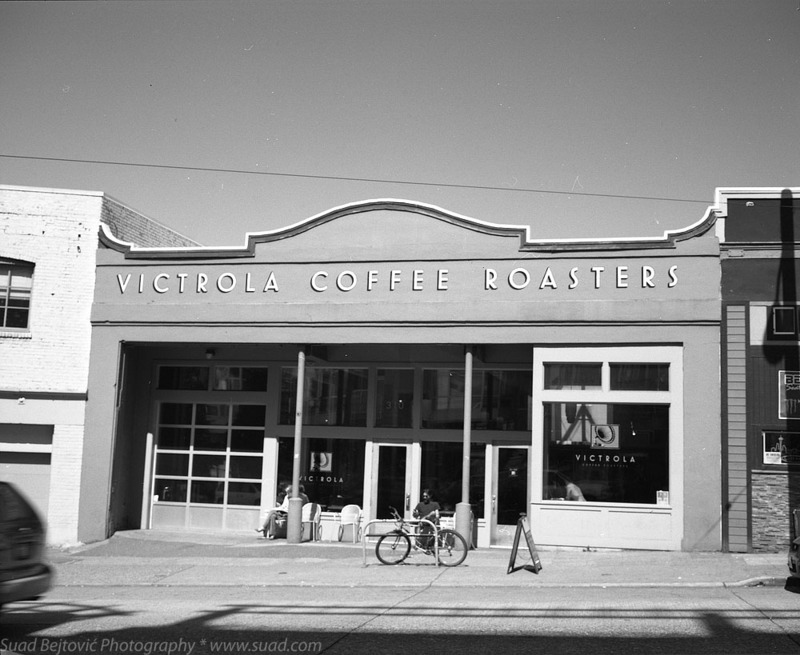 One other thing that Seattle is famous for is coffee, and the coffee houses are everywhere. This one caught my eye because it was particularly colorful, with its teal paint job and a gold window frames. 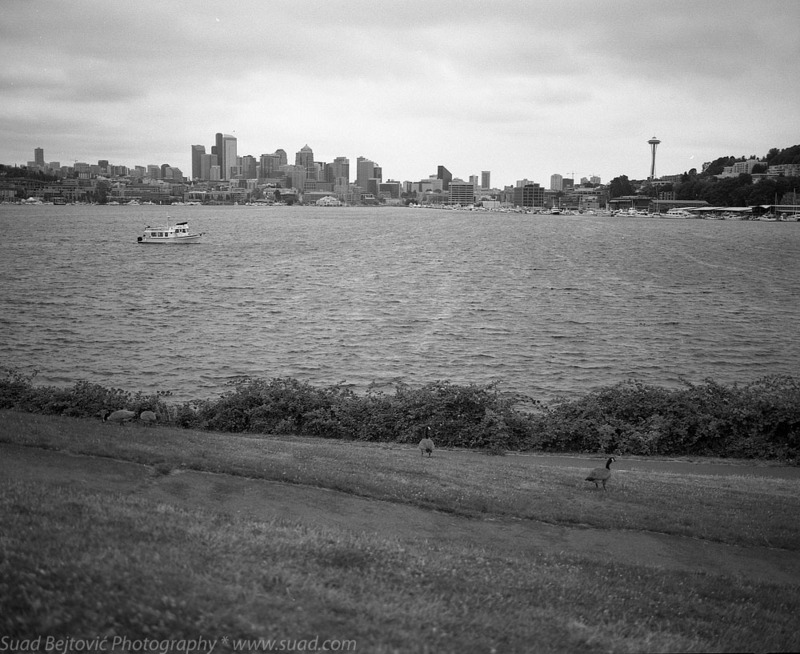 And yet, as I often do, I preferred this b/w film shot to my color digital. Maybe it’s the old-school font in the name of the business that gave the whole scene a more serene, relaxed look. The August days were surprisingly sunny, but this Monday started like a traditional Seattle day – gloomy, overcast, with a bit of a drizzle. I explored the neighborhood of Fremont and moved along the shoreline until I got to Gas Works Park. Tyler has made some fantastic images there, and I was excited to see the old machinery that still resides there, but the park is also a nice overlook to downtown Seattle on the other side of Lake Union. There’s Space Needle again on the right edge of the photo. 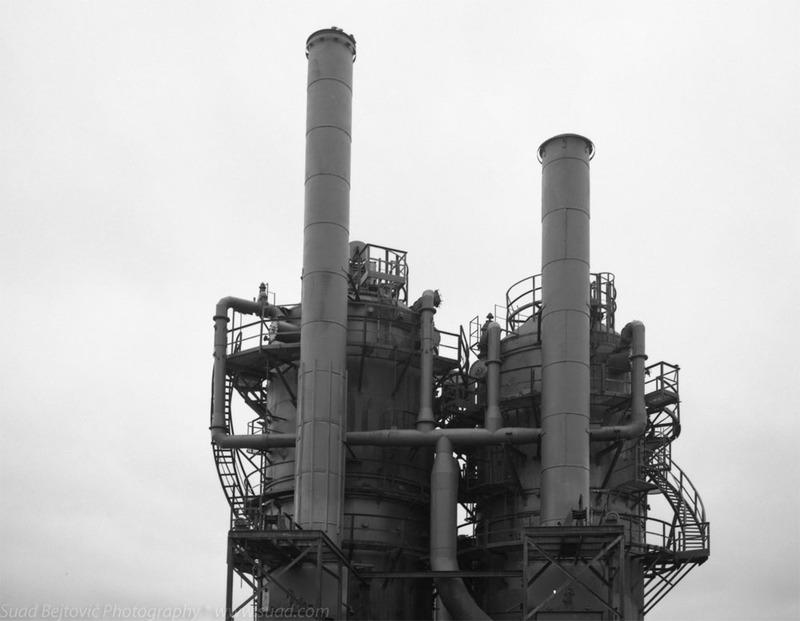 An interesting note about the machinery photo above is that I heavily corrected the vertical perspective in PhotoShop. In the original image, the chimneys were converging toward the middle axis of the photo. Because of the correction, the chimney on the left looks unusually large, but I’m satisfied with the overall result. And, finally, here is my favorite photo. With only a few hours before I had to head back to Seattle-Tacoma International airport, I took a bus toward Volunteer park and then walked over to Lake View Cemetery. 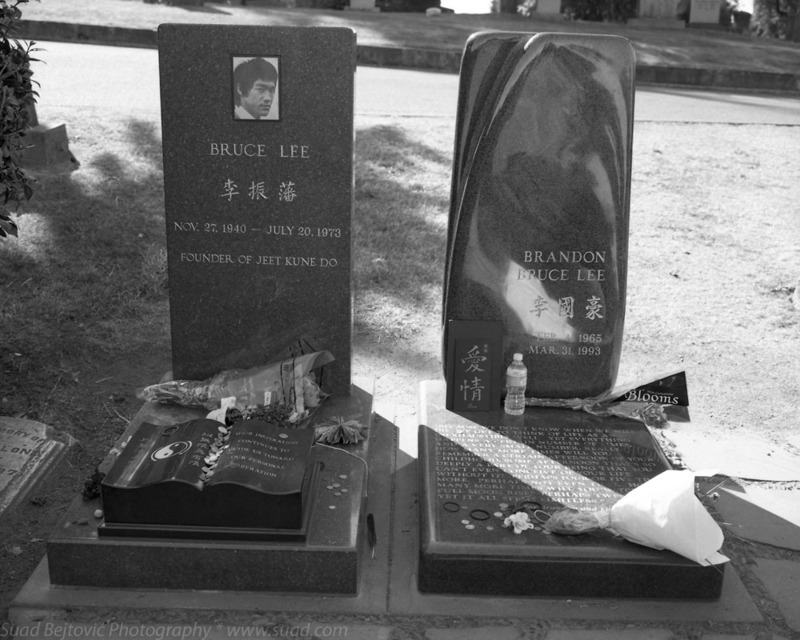 I wanted to visit one of the most visited grave sites in the US, the final resting place of Bruce Lee, my childhood hero and one of the coolest icons of the world of film. The cemetery office was across the street from the gate, so I stopped by to sign the guest book and pick up directions to find Bruce and his son Brandon. How cool was Bruce Lee? Well, consider this: Steve McQueen and Chuck Norris were among the pall bearers at his funeral. Rest in peace, master.